CAIR has a long history of affiliation with the terrorist groups Hamas and Hezbollah. Ilhan Omar will be keynoting with Hassan Shibly, the executive director of CAIR-Florida, who is vehemently anti-Israel, believes that Hezbollah and Hamas are not terrorist organizations and is known for openly discriminating against LGBTs. 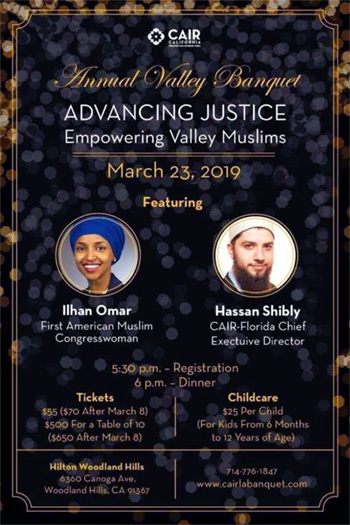 Congresswoman Ilhan Omar is slated to speak next month at a benefit for CAIR, the Council on American Islamic Relations, known for supporting terrorist organizations that have acted against Israel and the United States. The Muslim pro-terror group CAIR has selected her as one of two keynote speakers for their annual banquet taking place next week. The fact that Omar would agree to speak at an event like this at any time is beyond troubling, but to do it after a 3 month spree of virulent anti-semitic remarks and comments is breathtaking. Omar is sending a message, but is America listening? America is right now, as you read this, under attack from elements seeking her destruction. The Liberals, Progressives, and Democratic Socialists are all joining together in their quest to destroy the United States, and the Sharia Law muslims are along for the ride. Think of it as finishing what Barack Hussein Obama started. And if you think that America cannot be taken over legally by Islamic forces, then you probably haven’t been to London lately. Ilhan Omar is stocked to the gills, and ready for conquest. Does America have the guts to stop her and her allies before it’s too late? Please look in the mirror when asking that question. ISIS may have surrendered in Syria, but Islam certainly has not. Next up…Battleground America with ballots instead of bullets. At the time, he wrote that “to Israel, every tunnel – be it one that brings food into an impoverished Gaza Strip where over half of the population depends on food aid, or one that delivers sheep to a Khan Yunis farmer who lost his other farm animals to a prior Israeli incursion – is a “terror tunnel.” Following the attacks in 2015, Ayloush suggested that the US was “partly responsible” for the ISIS-led attack on innocents in California. Omar received heavy backlash for the comments and was accused of antisemitism, with leaders on both the Right and Left condemning her remarks. Just a few days later, she was also caught up in a controversy over whether or not she would be speaking alongside an official known for his antisemitic comments at an emergency gala dinner for Yemen on February 23 in Tampa, Florida.